The Indian Centre for Plastics in the Environment (ICPE) set up on the recommendation of a Task Force constituted by The Ministry of Environment and Forests (MOEF), is a body registered under Society Act on January 27, 1999. It is a nodal agency recognized by the Government of India to handle all issues related to Plastics and Environment in the country. To help sustain an environment friendly image of plastics by highlighting the positive role of plastics in conserving resources and its 100 % recyclability. To encourage, promote and support upgradation of the plastic waste management and plastic industry technologically and environmentally. To project Indian Plastic industry as environment conscious, socially responsible in all its acts, be it manufacturing, marketing or recycling of plastic waste. To inform, create awareness among the public at large on the importance of the right way of disposing plastic waste, the need for stopping the habit of littering and to impress on them that life without plastic is unimaginable and therefore we should act responsibly in the disposal of used plastics. To work closely with the Central, State and local administration in plastic waste management on behalf of the plastic industry in matters of legislation, creating infrastructure and facilitating in keeping the environment clean. Develop and encourage standards/ specifications / guidelines for plastic waste / recyclates for applications in various products. Sponsor/ undertake R & D work in the area of plastics in general, and plastics waste management in particular. Develop and encourage codification system for assisting recycling in critical and non-critical applications. Collect, collate, publish and disseminate statistical data and technical information on Plastic waste industry / Plastic Industry. Circulate information relating to Plastics Waste Industry / Plastics Industry for the benefit of manufacturers, consumers and regulatory bodies. Establish / maintain contacts / liaison and exchange information with similar bodies globally in the field of Environmental Issues and strategies in respect of Plastics Waste Management / Plastic Industry. The Founder members of ICPE are The Chemicals and Petrochemical Manufacturers Association (CPMA), an apex body representing the Chemicals & Petrochemical producers and Plastindia Foundation (PIF), the apex body of major Associations, Organisations and Institutions connected with Plastics with common objectives to promote the development of Plastics Industries. Established in 1993 CPMA represents the INR 50,000 crores ( USD 10 bn) worth Indian Petrochemical industry. It plays a central role, providing real time linkages between the industry, the Government and the society. It interacts with the policy makers and industry associations to develop and maintain harmonius and conducive business conditions. The policy frame- work and working of the ICPE are guided by the Governing Council and an Executive Committee. The Governing Council comprises 15 members drawn from CPMA, PIF, MOEF, Department of Chemicals and Petrochemicals (DCPC), National Council for Applied Economic Research (NCAER), National Chemical Laboratories (NCL) Indian Institute of Packaging (IIP), University Department of Chemical Technology (UDCT), and a Product Packer/End user. The 12 member- Executive Committee has representations from CPMA, PIF, Central Pollution Control Board (CPCB), Central Institute of Plastics Engineering Technology (CIPET) and Waste Management Experts. All major manufacturers of chemicals, petrochemicals (plastic resin and raw materials), plastic processors and manufacturers of processing machinery, plastic recyclers are our industry partners. # To support upgradation of plastic waste management in India. # Provide monitor & provide social, environmental & technological inputs in respect of the Plastic industry. # Develop and encourage standards / specifications / guidelines for plastic waste / recyclates for applications in various products. # Sponsor / undertake R & D work in the area of plastics in general & plastics waste management in particular. # Collect, collate, publish and disseminate statistical data and technical information on Plastic waste industry / plastic industry. To meet these objectives, ICPE has already launched or is in the process of launching and is committed to various technical programs & activities. ICPE has already sponsored research & development programs at UDCT, Mumbai for converting polyethylene carry bag waste into synthetic lumber and wax. The research program at the micro lab level has been completed satisfactorily. ICPE intends to continue sponsorship of similar programs with leading R & D institutions an laboratories the country. ICPE has been instrumental in developing the packaging guidelines and also the BIS Recycling Standards(IS 14534 / 14535) in the country. ICPE is also represented on the Bureau of Indian Standards - Plastic Sectional Committee (PCD - 12). The institution will continue various initiatives in developing and packaging standards & specifications in the country in line with international developments. ICPE has already conducted and will continue to conduct at regular intervals technical training workshops in the area of plastic materials & processing, plastics recycling and plastic waste management. These workshops are designed for industry members (plastic processors, recyclers), endusers, nodal agencies and general public to bring about enhanced knowledge/skills in the respective fields. ICE publishes from time-to-time technical & scientific presentation materials, booklets and other publications to bring about comprehensive technical awareness in the area of plastics & environment. These publications are used both for education and mass communication and mass communication programs. # Compactor for crushing & bailing of waste plastic bottles, glasses & cups in area like railway stations. One of such compactor has been successfully designed, installed and operated at church gate, Mumbai. # Pilot incineration Project is proposed for one of the metros in co-operation with local authorities. # Plastic waste will be utilized to construct long life superior test roads under the auspices of a central nodal agency (this is based on a know-how developed by local entrepreneur). # A mini recycling project for multiplayer films / laminates / pouches / sachets is planned along with one of the leading industrial research institute in Delhi. # Upgradation of tiny / small recycling units. ICPE commissions leading institutions to carry out Life Cycle Analysis(LCA) for various materials. Two such studies have been commissioned with IIT Delhi in the area of flexible packaging v/s. traditional packaging material. 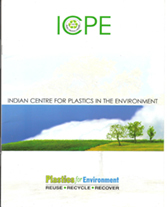 ICPE brings out publication that help remove apprehensions regarding any environmental negatives of plastics. These are published in English, Hindi and some major regional languages. ICPE organizes Press conferences in major cities to disseminate information on positive environmental attributes of plastics for the benefit of consumers, bureaucrats, municipal authorities and NGO's. ICPE promotes lectures, seminars in collaboration with CIPET & other related institutes. ICPE supports, sponsors and participates in international and National seminars in collaboration with other agencies. It also participates in plastic exhibitions held from time to time in different parts of the country. ICPE has engaged the expert services of leading communication consultants Burson Marsteller Roger Pereira (BMRP) for management of its complete PR & communication programmes and media campaigns. ICPE liaises with regulatory agencies for resolving issues related to plastics and environment. It encourages the industry to conform to the guidelines issued by the regulatory agencies from time to time. ICPE publishes "Eco Echoes" - a quarterly newsletter and circulates it widely for the benefit of the manufacturers, consumers and regulatory authorities concerned with plastics and plastic waste in India.On-line ICPE News Bulletin (monthly) has been launched. The website of ICPE is http://www.icpenviro.org Desined as an interactive site, it aims to disseminate information on all aspects of plastics and plastic waste including the latest news concerning plastic. The ICPE websites, like various associations, institutes, organisations connected with plastics. ICPE has been set up under the aegis of Ministry of Environment & Forest (MOEF), Government of India. In its day-to-day functioning as also long term & strategic planning and activities, the Centre has to interface with various Ministries/Government agencies/ departments covering regulatory and related issues. The primary interface is with the Ministry of Environment & Forest(MOEF) - both at the central & state level, Central Pollution Control Board(CPCB) & various State Pollution Control boards(SPCBs), the parent Ministry of Chemical & Fertilizers - Department of chemical & Petrochemicals(DCPC) & Bureau of Indian Standards(BIS) under Ministry of Industry. In the area of Waste Management, ICPE undertakes pilot projects in consultation with local self-government Bodies and civic Authorities on regular basis. Besides these, need-based interface take place with the Ministry of commerce, Department of Science @ Industrial Research(DSIR), Ministry of Food, Civil Supplies & Consumer Affairs and various other agencies. The membership of the Centreis open to all the plastic raw material manufacturers, processors, reprocessors, packers, end-users, R & D institutions, Trade & Professional Associations connected with development & Promotion of plastic waste industry / plastic industry, Chambers of Commerce and Industries. I. Institutional members: As decided by the Governing council, any association, organization, institution incorporated under any law or regulation for the time being in force and interested directly or indirectly in serving the wider means/aspects of the sectors of the plastic industry and related products and having. [#] Widespread membership i.e. [not confined to a particular region] shall be eligible to become a Institutional Member provided that such association, organization, institution is domiciled in India. II. Honorary members: The Governing council shall have the power to enroll as Honorary member of the Centre distinguished individual persons who may have rendered special, outstanding, or meritorious services in the country in general and / or Plastic industry in particular. III. Patron members: Any person/undertaking incorporated or otherwise, connected directly or indirectly with the plastics and or related material industries shall be eligible to apply as the Patron Member of the Centre. IV. Sustaining members: Any desired person for membership mentioned in para3 shall be eligible to apply as the sustaining member of the Centre. a] Any applicant, who desires to be a sustaining, Patron and Institutional member of this center shall pay in advance a sum of Rs. 5000[Rupees Five Thousand only] as admission/entrance fees and on approval of membership the same shall form the corpus fund of the center. A desiring member shall apply to the center for the membership on the prescribed form to the governing council, together with the amount of admission/entrance fees and annual fees either be cheque or cash as fixed by the center. On receipt of the completed application form, the governing council at their earliest would consider the same. The governing council shall not be bound to assign reasons for rejecting an application for membership and its decision shall be final and conclusive. The Governing Council may nominate an individual as honorary member of the center in consideration of the distinguished service rendered by him in the interest of the trade Commerce and Industry of the Country. An Honorary member shall not be obliged to pay the subscription / admission fees but shall be entitled to all privileges of a member. The duration of membership shall be for a period of 3 years. Honorary members will not be required to file an application form as required herein. c] if he fails or they fail to pay the annual fee for membership within first three months of the official year or within any extended period sanctioned by the Governing Council. a] To obtained publications of the center on the terms fixed by the Executive committee. b] To the use of the library / research and testing facilities of the center on the terms fixed by the Executive committee. c] To be elected as President or member of Governing Council or Chairman of Executive Committee as defined later on ; however patron members and sustaining members shall not be entitled to this. ENVIS_ICPE is one of the identified focal points, called Envis Centres on Environmental Information System - fully sponsored by Ministry of Environment and Forests, Government of India on " Environmental Management Capacity Building Technical Assistance Project". The main objectives these Centres are to collect, collate and disseminate information relating to Environment to Universities, Registered Societies or Private Bodies or State Government Departments / Organisations. The objective of ENVIS-ICPE Centres is to collect and supply information on Management of Plastics, Polymer Wastes and Biopolymers, Impact of Plastics on Eco-System.